How is it possible that it's going to be March on Sunday and it is still this frigid cold out?! It is seriously not ok. My only hope is that March will soon bring warmer temperatures because every one's spirit in the Midwest is in dire need of some warming up! Here are a few moments from my week. 1. Charlie's been seeming to feel a lot better lately, which is awesome because since his emergency vet stay this summer he has been up and down. He is still on meds daily, but he seems to be getting back his energy and appetite, so I only hope that he keeps improving. 2. Before our event this last weekend I picked up some chocolate favors from one of my favorite local shops, Anna Shea Chocolates. 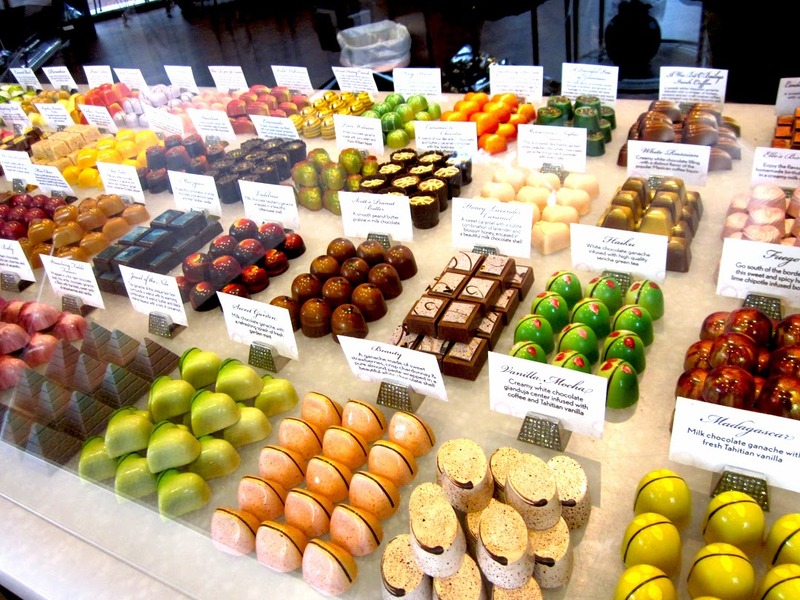 They have the cutest, ornate, and delicious truffles and while I was there I got a chocolate based chai and it was probably one of the most delicious things I've had. 3. At my acupuncture appointment on Monday I was so exhausted from the weekends activities that I passed out cold, I didn't even realize I was done until all of a sudden I realized there was someone in the room with me removing the needles! 4. My friend posted this on Facebook and I have felt like this more days then I can count this week. 5. My current obsession, seriously, this stuff is so good. I could eat these California rolls with spicy mayo everyday. I take the lid off and just the smell alone. . . it's making me hungry just thinking about it! I am so looking forward to some time to catch up with life this weekend. You know the fun stuff, sort through the mail, get the laundry done, pick up the house and hopefully a little rest too. What's on your plate this weekend? I've always wanted to try accupuncture. Do you like it? Is it weird?? Also I can't adult most days. It's totally acceptable. I've done that at the acupuncturist before. It's a good nap! Wow those truffles look soo good! How cute! I'm glad Charlie is doing better, what a sweet boy! It's so hard when our pets aren't themselves! Have a wonderful weekend beautiful girl! xo! Awe, I'm glad Charlie is getting better! That sweets shop sounds so cute. Hope you had a good weekend! Oh. My. Goodness. That "I can't do adult today" pic - definitely me almost every day. Some days it's just hard! And right with you on thinking warmer weather has to begin on March 1. We had an ice storm today... seriously??? Hope you're having a great weekend! Thanks for linking up again at H54F!! I do really like it, most days, sometimes I can be a little impatient with how long you have to lay there with the needles, but it's not weird, you can't really feel it at all. Definitely something to give a try! Oh my god, I was knocked out cold! Lol, don't get me started! I had it Thursday, Friday, and Saturday and could so go for it again today! They are so good, and the store is the cutest! They are delicious, and the shop is equally amazing. Sometimes I just wish our pets could let us know what is going on with them, it would be so much easier. Hope you had a great weekend, love seeing the progress on the house! It's the cutest little shop and they have the best little lounge area, complete with a fire place and comfy couches. Hope you had a great Birthday weekend! I know, come on March please bring us warmer weather, I think we are all desperately in need! I have been so interested to try acupuncture I definitely would love to hear your thoughts on it! I love it, it's nothing that I necessarily felt immediate results from but I can totally tell the difference over time with how I deal with stress and how I barely stress out anymore that's been the best for me and it also forces me to have down time for myself which I'm not good at taking!